I have been subscribing to the email newsletter "Shelf Awareness." In today's issue is an article about the Open Book store in Minneapolis. Now, while I am a latecomer to the upper Midwest, and certainly don't know what the neighborhood used to be like, I did have the opportunity to visit for a reception at the PLA National Conference. It is a great store, it houses several (?) small presses, and has an incredible workshop for printing. There is a cute gift shop which I also patronized while there, and there is the now-required coffee bar. my grandmother passed away on wednesday. that's her in the middle, in the green sweater. i guess you could consider her a matriarch. She was born in 1925. she grew up on riverside drive in manhattan. she told me stories of playing in the hudson and all around the city. she was turned into a paper doll. she was apparently hot stuff and went on lots of dates. she knew from high school that she wanted to do medical research. she went to brown when there was still a seperate women's school. she met my grandfather there, and about a billion generations on both sides had gone to brown. i know she graduated in 1947. i don't know when they married, or exactly what my grandfather did, but i know they had their first child, my dad, in 1953. she had 7 other children over the course of about 12 years. she did research at the worcester foundation for experimental biology at some point. my grandfather died in 1976 of melanoma. her father died some time in the '80s. growing up, there were always easters at grandmas. christmases at the church hall. summers at the beach houses. weekends when she would take care of me and my brothers. trips to mystic, the snapping turtles, the park with the duck pond. brown football games at yale and columbia. her charm bracelet with charms for all of the cousins that she would show to everyone. her "ask me about my grandchildren" license plate. she was the coolest person ever because she was the only one who could rightfully tell my dad to shut up. she was involved in girl scouts, brown sports foundation, a family care clinic, the inland wetlands commission, her church, and more groups that i can't even remember. there is a vernal pool named after her. she lived 7 months and 20 days longer than they gave her. basically, she was an amazing woman. It has been quiet here lately. Partly because my mother has not been well. 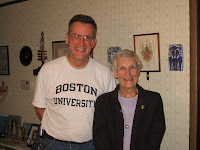 Earlier this afternoon, I heard from one of my brothers that she died peacefully in her sleep at age 82. Posted here is one of the last really good pictures before she began not feeling well a couple years ago. It was taken en route back from dropping my daughter off at college (hence the Boston University shirt on yours truly). Once the obituaries run (tomorrow or the next day), I will also link to them. When she had a major health crisis this past fall, I spent time with my brothers and sisters. We spent some quality time together and dealt with planning a number of the hard issues, including visiting the funeral home and the local church. That planning has made this particular crisis easier than it otherwise might have been. The second photo was taken two Christmases ago. 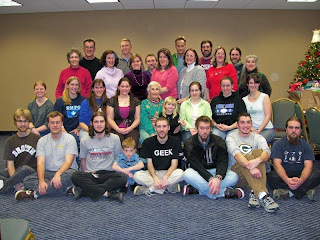 It shows my mother and me with all my brothers and sisters ("the siblings" to some of my friends and colleagues). 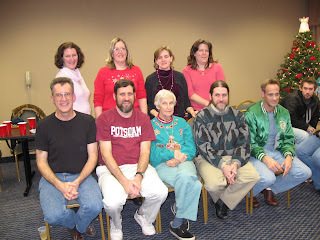 In this photo are (l to r): front: me, Paul, Mom, Peter, Thomas; rear: Meg (Margaret), Beth (Elizabeth), Helen, and Sue (Susetta). Today was the April day for Leadership Eau Claire. It was "Media Day." We visited the local newspaper plant, a local TV station, one of the local radio station groups, and heard from media experts at UWEC. Going from one to another, we went by school bus. To entertain us on the bus, one of the members of the class entertained us with his accordion. Here is a clip. Yes, I know I still owe an evaluation, and it has been percolating in my head a little. However, I have to share this which was also in American Libraries Direct. It is my excuse to figure out how to embed a video.